The 1813 Battle of Leipzig is known in Germany as the Battle of the Nations (Völkerschlacht). It was greatest fight in European history prior to World War I, with nearly 400,000 Russian, Prussian, Austrian and Swedish troops up against 200,000 of Napoleon’s best. The French were defeated after four days of fighting. That this turning point in the Napoleonic wars is so little known in Britain is partly due to our absence from the field, as we were distracted by the American war that started in 1812. But it is also due to the parochial triumphalism of our history teaching, which ensures that every English child has heard of Agincourt, which changed little, and hardly anyone of the English defeat at Castillon, which ended the Hundred Years’ War and our rule in France. However, I’m not going to go on about battles in this article—there are many other GP contributors who are far more knowledgeable, and a few who have actually fought in battles. What interests me here is how wars are remembered in Germany, a country with a particularly problematic relationship with military endeavour. The Völkerschlacht monument at Leipzig is the most recent, if not the only, major monument to fallen German soldiery that I know of. Despite the scale of their losses in modern wars, especially World War I, there are few memorials on village squares or in the churches in Germany. Graveyards do contain private graves of the fallen and small monuments for them, and you can find rows of graves in cemeteries at specific battle sites. But there is no public tomb of the unknown soldier. As far as I know, there is no national monument for 20th century wars. But there used to be one. It was in what is now Poland. The Tannenberg National Monument was erected at Hohenstein, East Prussia — now Olsztynek — to commemorate the two million Germans who perished in World War I. The compound took four years to build, from 1924 to 1927. A group of foursquare towers placed in a circle and linked by walls, it was curiously reminiscent of Stonehenge, only vastly bigger and unmistakably totalitarian in character. The location was carefully chosen. Tannenberg was the scene not only of Germany’s rout of the Russians in 1914, but also of the heroic defeat of the Teutonic Knights by a Polish-Lithuanian army in 1410. It was more than a cenotaph. A sports facility was attached to the south, for the training of the sons and daughters of the fallen. The approaches were deliberately left without a proper road, so that visitors were obliged to walk respectfully up to it. Veterans of World War I met there annually. It became a place of nationalist pilgrimage, that schoolchildren were required to visit. For the Nazis, it served as a propaganda tool and a rally venue. For the Poles, it was massive German bastion near their eastern border, a symbol of lasting conquest. But it did not last. In January 1945, it was blown up by the Wehrmacht as they retreated before the Red Army’s approach. Nothing now remains. Looking at the old photographs, you are awed by its scale, and the brutally simple geometry of the walls and towers, which give it overall the air of both a penitentiary and a place of ritual sacrifice. As a form of commemoration, it stood in stark and telling contrast to the simple dignity of England’s innumerable village green memorial columns. Why didn’t the Germans build a new memorial after 1945? It’s an interesting question. All over France, Belgium, Britain, the Netherlands and other places, you find memorials to the fallen in World War I (and of course World War II). But in Germany there is almost nothing — greens are bare, and churches have few plaques. Cologne Cathedral, for example, has nothing, I was told by a steward, even though most of the rest of the city centre around it was bombed to oblivion. While November 11 is marked throughout much of western Europe, the date means little in Germany. Such public memorials that do exist, in the old East Germany, are for Communist resistance heroes, not ordinary German soldiers. 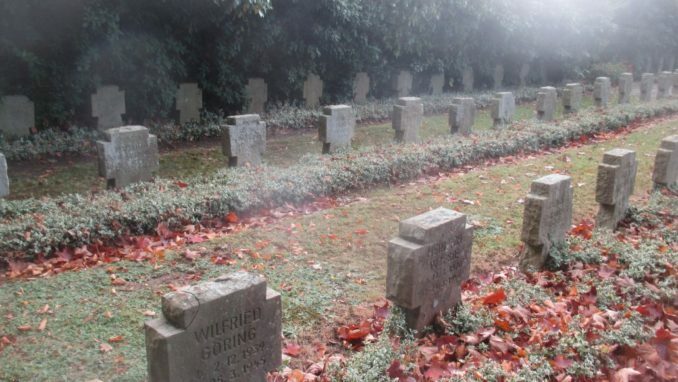 Although German graveyards are found in Flanders and elsewhere — Cannock Chase is one of the unlikelier places — there are only a few dedicated World War I burial grounds of any size in Germany. One is Neuer Garnisionsfriedhof in Berlin, which includes the graves of several thousand soldiers who were repatriated from the front with fatal wounds and who died on German soil. It is the subject of regular attentions from Germany’s infantile “anti-fascist” groups, who do not like the idea of Germans paying their respects to dead “militarists.” Another, irony of ironies, is the Jewish cemetery at Weissensee, also in Berlin, which has 12,000 graves of German Jews who died in World War I. “Wir starben, auf dass Deutschland lebe, so lasset uns leben in euch! (We died so that Germany may live, so let us live in you),” reads the inscription on the monument at Neuer Garnisionsfriedhof. Reading this, you begin to understand why modern Germany has turned its back on those who gave their lives for the Vaterland. Partly, it was the simple fact that Germany lost and was plunged into disaster, whereas for France, for example, World War I was a nation-forging event as the civil war was for the United States. However, there is another reason. We died so that Germany may live, so let us live in you — these were the sentiments Hitler harnessed in rebuilding Germany as a conquistador state. World War I memorials became Nazi rallying points. The soldiers who died in World War I were, so to speak, posthumously pressed into the cause of fascism in Germany. As a result, World War I has become subsumed within the guilt-ridden collective memory of World War II. These inconvenient dead also remind Germans today of the deeper, nagging question of whether World War II was really, ultimately, a continuation of World War I, following the Versailles humiliation. Privately, many Germans do suspect this. Either way, most today do not want to talk about such things. And so, as a people, they ignore the sacrifice of millions of their fathers in the trenches. I don’t think there is another nation on earth where the sacrifice of the fathers is treated with contempt by the sons and daughters they died for. The situation could not be more different in Japan, where the huge Yasukuni shrine in Tokyo commemorates the fallen (and even their horses), and the organisation of war-bereaved families forms a powerful political lobby that has blocked all attempts to get the government to apologise properly for Japan’s conduct in World War II. In Tokyo, there is also a large memorial to the Japanese fallen in China; yet Germany has nothing that I know of for the hundreds of thousands who died on Russia soil. I have mixed feelings about this. Japan has emerged from the ruins of war without immersing itself in the self-abasement and self-hatred that now characterise Germany, but at the cost of permanently alienating its two largest neighbours. But that perhaps is stuff for a different article. Also on that website are my travel books on East Asia, Shenzhou and Among the Dragons, and an English-language synopsis of Thilo Sarrazin’s Deutschland Schafft Sich Ab (Germany abolishes itself), a withering dissection of Germany’s multiracialism drive. All are free for reading or downloading.